WASHINGTON — After three days on the run, Ahmad Batebi picked his way down a rocky slope to the stream that marked Iran’s border with Iraq. His Kurdish guides, who had led Mr. Batebi, an Iranian dissident, through minefields and dodged nighttime gunfire from border guards, passed him to a new team of shadowy human smugglers. At the age of 31, after nearly eight years in Iranian prisons, subjected to torture and twice taken to the gallows and fitted with a noose, Mr. Batebi had fled. But in Iraq, his former captors had one more chilling message for him. Not long after his arrival in Erbil in March, the new cellphone provided byUnited Nations officials rang. Mr. Batebi was shocked to hear the familiar voice of the chief interrogator at one of Iran’s notorious prisons. Instead, Mr. Batebi, one of Iran’s best-known dissidents, received permission to enter the United States. He arrived on June 24. In several lengthy interviews, Mr. Batebi provided an unusual window on Iran under its ruling clerics. His alienation began at age 9, when he witnessed a deadly stoning. He rose to fame in 1999, appearing on the cover of The Economist magazine holding the bloody T-shirt of a fellow student demonstrator — an image he first saw when a judge slapped it before him and declared, “You have signed your own death sentence.” Finally, after a decade of political combat, he reluctantly decided to abandon Iran for an uncertain exile. His escape has prompted a paroxysm of denunciation in Iran’s controlled news media, which have accused him of defrauding creditors and suggested that he has long been in league with the United States and Israel, claims that human rights groups dismiss as crude propaganda. From his Yahoo blog, Mr. Batebi has replied, posting the taunt, “Your hands will never reach me” and the instruction “Click here.” The photograph that pops up shows the dissident, an Iranian Johnny Depp with a ponytail and a satisfied expression, posing in front of the United States Capitol. While some details of Mr. Batebi’s biography, his treatment in Iran and his escape could not be independently confirmed, he provided a video he took during his journey, and independent advocates vouched for much of his account. He knows he has arrived during a time of tension between Iran and the United States, and he said he did not want his story to heighten the conflict. Wary of being viewed as a pawn of American policy, he said that the United States played no role in his departure from Iran, a fact American officials confirmed. The United States did give him permission to enter this country “out of concern for his safety,” said Gordon D. Johndroe, the spokesman for the National Security Council. He said Mr. Batebi attended a courtesy meeting with N.S.C. staff members on Friday. Mr. Batebi may have inherited his jaundiced view of his country’s leaders. After the Islamic revolution of 1979, his father, a customs bureaucrat who had fallen out of favor with the shah’s regime, declined to join the Revolutionary Guards. His mother, a first-grade teacher, taught him and his younger brother and sister a mild, Golden Rule Islam that had little in common with the ayatollahs’ harsh theology. A few weeks later came the stoning. Though forbidden by his mother, he slipped out of the house to see the commotion near his school. He saw a man, accused of adultery, buried to the waist, his head covered with a sack that turned red as Revolutionary Guards hurled chunks of concrete. A mullah standing atop a wall gave the orders, and an ambivalent crowd of neighbors looked on. “I was utterly shocked,” he recalled. “My hands and legs were shaking.” Afterward, he suffered from nightmares. A photograph of Mr. Batebi in 1999 holding a protester’s bloody shirt altered the course of his life. At the University of Tehran in the mid-1990s, Mr. Batebi embraced his photojournalism studies and made two dozen short films with existentialist themes, often with his own electric guitar for a soundtrack. He also joined in student protests, getting arrested three times. In fervent late-night discussions, he recalled, one admired model was the Rev. Martin Luther King Jr. The demonstrations exploded in 1999 in what would become known as 18 Tir, the date according to the Iranian calendar. In a wave of protests that threatened the 20-year-old regime, hundreds of students demonstrated against the closing of a newspaper, Salam. Mr. Batebi, busy making his senior thesis film about drug addiction, stumbled upon the demonstrators and joined in. When the police fired into a crowd, a bullet hit a young man next to Mr. Batebi, who pulled off the student’s shirt to try to stanch the bleeding. After carrying the wounded man to a makeshift clinic, he held up the shirt to warn other students against marching outside. A photographer caught the moment. Mr. Batebi was already in jail when The Economist published his picture, putting him in far greater peril. When the judge hearing his case showed him the magazine, Mr. Batebi reacted with both fear and perverse pride. Twice he was led blindfolded to the gallows. Once the noose was left around his neck for 45 minutes, and he passed out from fear, he recalled. The second time, he sat, waiting, as a prisoner on each side of him was hanged. The photo that so infuriated the authorities may have saved him, as advocates around the world took up his cause. His death sentence, for “agitating people to create unrest,” was commuted, first to 15 years and then to 10. In 2005, allowed a day pass to take exams for a sociology degree, he decided to flee. He remained free for five months, working in the political underground and marrying a young dentist. But after she was jailed because of his activities, they agreed to end their union, he said. After Mr. Batebi was rearrested in 2006, the harshest treatment stopped. But he was sometimes forced to watch his friends being tormented. Last year, after Mr. Batebi suffered what was probably a stroke and several seizures, he was released for medical treatment. On a Yahoo chat site, on March 13, Mr. Batebi contacted Ms. Mazahery, the lawyer, who he knew had helped other Iranians get into the United States. At the same time, through a connection made in prison, Mr. Batebi sought help from the underground Kurdish Democratic Party of Iran, which soon directed him to Argentine Square in Tehran. To his surprise, his Kurdish helpers — volunteers whose real names he never learned — said he had to leave immediately, taking advantage of the authorities’ lax attention during the Iranian New Year holidays. Carrying only a backpack containing his Dell laptop computer, a camera and a pocket-size video recorder, he retrieved some money from an A.T.M. and climbed into the strangers’ car. The next two days were a blur, he said, as he was driven in a series of cars on a circuitous route to the northwestern border with Iraq, a straight-line distance of about 300 miles. Once, his ride was with a family. Another time, it was with a mother and her baby. A third time, he was directed to board a bus. With many precautions, the Kurdish underground railroad moved him to the border — he will not say exactly where. Then a new five-man team took over. For a day and a half, with burros carrying supplies, they moved along the border, which was patrolled by guards and protected by land mines. One of the escorts walked ahead to ensure that the way was clear, Mr. Batebi said. They heard sniper fire and occasional artillery bombardments, but never came under direct fire. Mr. Batebi’s tiny camera captured shaky images of the burros traversing the dry, rocky hills and gullies. Peering over bluffs, the group could see the flags of two nations facing one another at lonely border posts. On March 20, when Mr. Batebi’s guides handed him over to new Kurdish guides in Iraq, he said, he felt no elation. His protectors brought him to the Erbil offices of the United Nations High Commissioner for Refugees, which began the laborious process necessary to move an Iranian with no passport and little identification to a new land. His Kurdish allies believed that an Iranian hit team was hunting for him, so he was moved from one safe house to another for three months. He was shaken one day by the unexpected phone call from the Iranian interrogator, a man known by the prison pseudonym Javad Javadi. Mr. Batebi sought to turn the tables on the interrogator, firing questions back at him and capturing a digital recording of one of the calls, but he knew he had to get out. The United Nations was arranging a placement in Sweden when Ms. Mazahery called to say that the United States had granted Mr. Batebi’s request for “humanitarian parole,” a relatively rare measure used in cases of danger or political importance. When his flight from Vienna landed at Dulles Airport in Virginia in late June, Mr. Batebi was astonished to see that the airport worker waving the jet into the gate was a Muslim woman wearing a tight head scarf. Mr. Batebi was enthralled, sensing a casual tolerance that was exactly what he had longed for in his own country. “It seems to me that people here are free to live their lives, as long as they do no harm to anyone else,” he said. There are more distinguished figures in the Iranian opposition, people who have spent decades in the struggle, as Mr. Batebi is quick to acknowledge. But he is discovering that few are so recognizable. 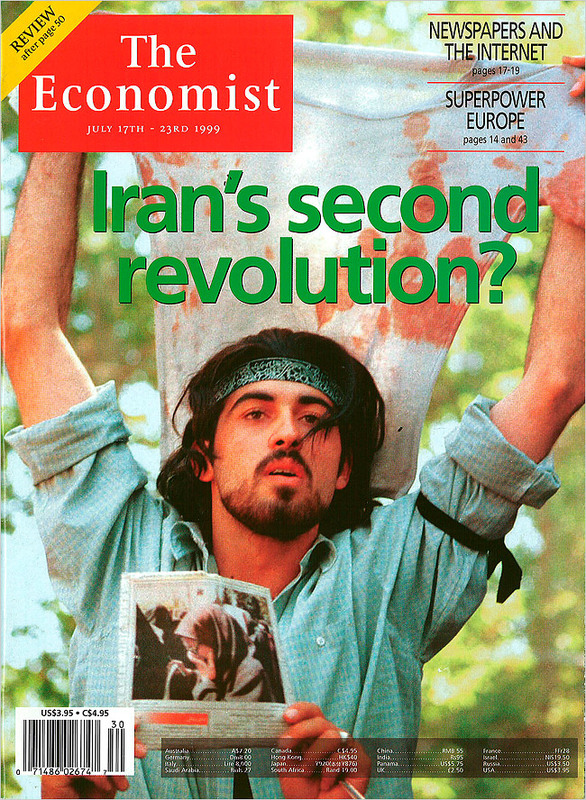 For the Iranian diaspora, The Economist’s 1999 photo remains an iconic image. Mr. Batebi was a little nonplussed, Ms. Mazahery said, when an Iranian-American woman outside a Washington grocery store walked past him a few days ago, did a double take and called out his name. When he said that, yes, he was Mr. Batebi, the long-imprisoned dissident, she burst into tears. Zahir Janmohamed of Amnesty International USA called Mr. Batebi “grounded and humble” about his role. “As a human rights activist, Batebi’s credentials are unquestionable,” Mr. Janmohamed said. But he warned that now, as Mr. Batebi joins an exile community whose rivalries are legendary, many factions would seek to recruit him. He has some ordinary goals, the dreams of a man who spent most of his 20s in a prison cell. He wants to study politics and sociology, he said, and work as a photojournalist. He wants to play guitar. He thought for a moment, then he remembered one more modest ambition.